No, we won’t be collecting Mardi Gras beads at our farm this year, but we are sure glad that we collected enough vegetables over the summer to help us out with this great winter time dish. This recipe was first introduced to me by my Father who loved to watch Justin Wilson, “The Cajun Cook” on PBS whenever he could. Not only would he watch him, but he would also try to speak like him. Now, being from Ohio, it was quite entertaining to hear him try to replicate the famous I “gar-on-tee” quote with his northern accent. Not quite the same as what you hear down south, but at the same time, something I will never forget. As we introduce you to this classic New Orleans dish, we are thankful to be lucky enough to use several of our canned and frozen garden products as ingredients. We were able to pull from our canning shelf our diced tomatoes, tomato juice, and hot pepper flakes. Oh, and don’t forget the pure habanero sauce that we canned this year (a frequent family request for any soup, stew, or cajun dish that we make). We also were able to pull out our sliced sweet bell peppers out of our freezer and open the food safe package that kept them nice and crisp. 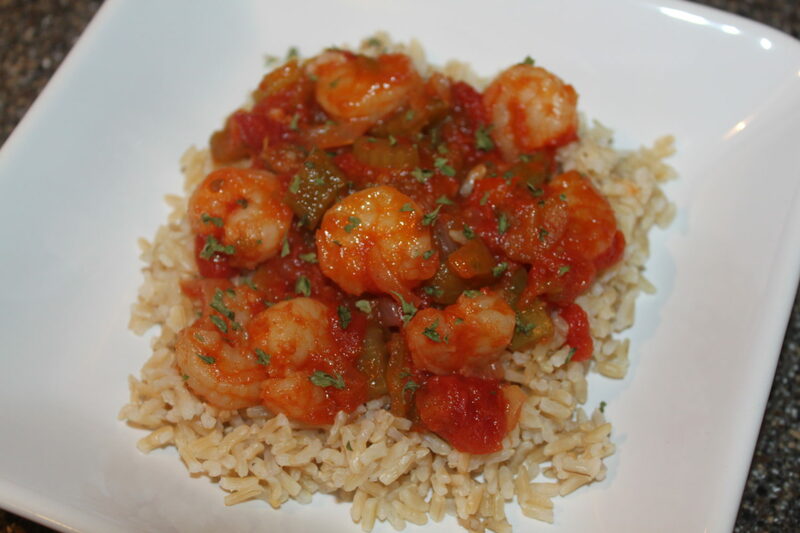 This week’s recipe has many variations that can be adjusted to your likes/eating preferences. For instance, we used shrimp today, but you could also use diced up chicken (no, we have no intention of using Big Mamma for this recipe – EVER). You could also make it vegetarian by omitting the meat portions at all. Regardless of your style of eating, the flavor that this recipe provides is outstanding – I ‘gar-on-tee’ it! In a large skillet, sauté onions, celery, parsley and bell peppers until tender, approximately 4 minutes. Add water, garlic, tomatoes and tomato juice and simmer 5 minutes. Season mixture with Worcestershire sauce, hot sauce, salt, and hot pepper flakes and cook for 20 minutes. Add shrimp and cook an additional 20 minutes, or until shrimp are curled, pink and tender. Mixture should be of a thick consistency. Serve over steamed white or brown rice. Each week – we will share a recipe that was inspired from produce from our garden. Whether it be fresh, or from our canned or freezer supply – it’s always a great way to enjoy our own home-grown produce! You can get our “Garden Recipe of the Week” by clicking the “follow blog via email” button on the right side of our blog page, enter your email address…and your in! ← We are New Parents…well, sort of.